bliss in a teacup: Hey Hey, My My and twisted tea cakes. Hey Hey, My My and twisted tea cakes. Last Wednesday I got to see someone who, in my opinion, is one of the greatest musicians of all time. I discovered Mr. Young fairly early on, and developed a bit of an attachment. I'm sure much to the horror of my boy-band listening friends (thankfully I also loved NKOTB). I didn't think Neil Young would ever be someone I would get to see live, so jumped at the chance when I heard he was coming to Vancouver. To be honest I was a little worried that it wouldn't be everything I'd hoped(i.e.Massey Hall in the '70s), and that he'd be a grouchy old man not wanting to play any of his 'hits'. Lets just say, it was incredible. For a guy in his 60s, he totally rocked out! He pulled out so many classics, Cowgirl In The Sand, Cinnamon Girl, Heart of Gold, Hey Hey, My My, Old Man and of course Rockin' In The Free World and many others. He did a fantastic rendition of A Day In The Life for his encore while pulling strings off his guitar, and I was smitten. Ok, completely unrelated but please observe the following. 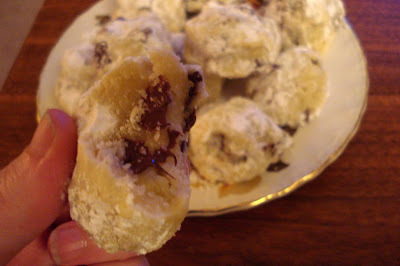 Why yes they are small morsels of chocolatey, cookie dough goodness. I realise they have nothing to do with Neil Young (although I'm sure he'd like them), I was too excited to not share these with you. Inspired by the Russian Tea Cakes Julie had bought over the other night, I wanted to make some for myself. However, Richard was begging for chocolate chip cookies....and I of course didn't have all of the ingredients for the tea cakes. So I did them with a twist. 2. In a medium bowl, cream butter and vanilla until smooth. 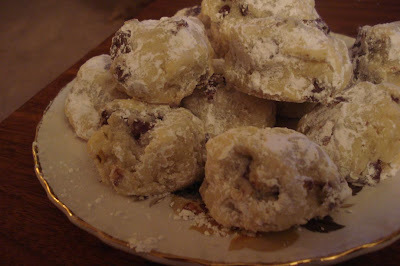 Combine the 6 tablespoons icing sugar and flour; stir into the butter mixture until just blended. Mix in the chocolate chips. Roll dough into 1 inch balls, and place them 2 inches apart on an ungreased cookie sheet. 3. Bake for 12 minutes in the preheated oven. When cool, roll in remaining icing sugar. Real Russian tea cakes use chopped walnuts where I used chocolate chips but a) we didn't have any left and b) Richard wanted the chocolate. Needless to say, they're amazing. Especially when eaten warm with a spoon. Perfect for a quick late night treat, enjoy! Oh Neil. What a dreamy show that was, indeed! And, please, I think we need to start a letter-writing campaign begging Joni to puhlease tour again. Just for us. I'm glad you liked the tea cakes so much you wanted to make your own. They look really really good. WOW Neil Young that would have been amazing! Lucky you!! Love a man who can cook.